The fourth round of UN-led peace talks on Syria are underway in Geneva with hopes for a political solution somewhere over the rainbow. The UN special envoy for Syria, Staffan De Mistura, has been meeting with the Syrian government delegation, implacable as ever on the future of President Basher al-Assad, if not more so since events on the ground have shifted significantly back in his favour. 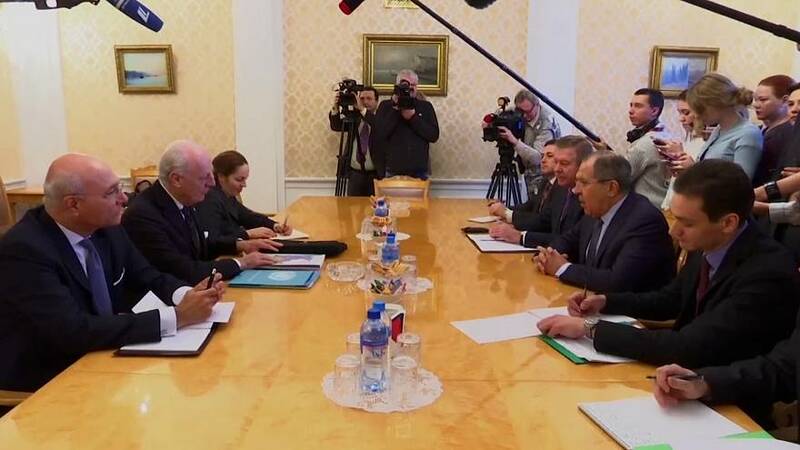 De Mistura held recent talks with Russian Foreign Secretary, Sergei Lavrov. In an attempt to create an atmosphere of goodwill Lavrov called on Syrian war planes to refrain from missions during the current, at best, fragile ceasefire. That Russia has to make such a declaration during a ceasefire speakes volumes about the seriousness of the truce and the respect for the current peace talks. Russian and Iranian intervention and American absence has turned the tide in Assad’s favour and in the words of new UN secretary general, António Guterres, “Peace is only possible when none of the parties to the conflict think they can win,” he said. The diplomatic dice are now held by Iran, Turkey and Russia the three have held two meetings in Astana, Kazakhstan. De Mistura’s old school diplomacy is looking jaded, he had to fight hard to keep the UN’s grip on the peace talks after Russia moved to take charge. The three previous peace talks in Geneva have achived nothing and last year De Mistura broke up the talks after two barren sessions with an obdurate Syrian government delegation. Since then eastern Aleppo is back in government hands and the those on the ground say rebel forces are in disarray with Assad now believing he can win the war. He is far from regaining control of the whole country, but with the backing of Iranian supported militia and Russian air power he is in a much stronger position and calls for him to leave office are growing dimmer by the day. Turkey, formally the most vociferous anti-Assad voice, has changed its tune and is now cooperating with Russia in Syria and focusing its efforts on preventing the Kurds from gaining territory in the north of the country. The new US administration has been almost silent on Syria except to withdraw the military support to the Syrian opposition sanctioned by the previous president.